Embroidery Design CD from OESD. 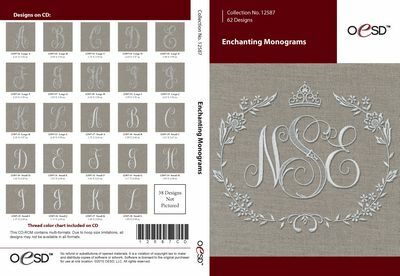 Monograms are an essential for personalizing embroidery projects. These enchanting letters come in 2 sizes PLUS bonus SVG files for vinyl cutters. And with the 10 accent designs, there is no limit to the projects you can create! Comes with complete project instructions to make the pillow and stocking shown here.